With the constant stresses of work and life in general, we often find ourselves feeling beat down, overwhelmed, and mentally exhausted. Although many of us feel there are not enough hours in the day to finish our daily tasks, research shows you may want to take a “brain break” and set aside time to be mindful and meditate. Mindfulness meditation has been found to elicit a positive impact on cognitive performance and abilities such as attention, memory, cognitive flexibility, and quality of task performance.1-3The word “mindfulness” is used to describe a specific way of paying attention to the present moment characterized by a receptive and non-judgmental attitude.4 This technique can be practiced informally on an individual basis or formally in group-based settings. Another study that assessed the link between meditation, self-reported mindfulness, and cognitive flexibility found that high levels of mindfulness correlated with high processing speed and good attentional and inhibitory control. In addition, it is associated with reduced errors, suggesting greater attentional control, accuracy of visual scanning, carefulness, cognitive flexibility, and quality of performance.1The benefits of practicing mind-body techniques like mindfulness meditation are purported to enhance our ability to access brain function and support mental energy. Lauren Martinearned a Master of Science in Human Nutrition from Columbia University. She is a candidate nutrition specialist and intern at Metabolic Treatment Center. She co-founded Martin Family Style, a lifestyle, food, and nutrition blog. Lauren is the lead author of the blog's nutrition section. She earned her Bachelor of Science in Nutrition from Oklahoma State University. Moore A, Malinowski P. Meditation, mindfulness and cognitive flexibility. Consciousness and Cognition 2009;18(1):176-86. doi: http://dx.doi.org/10.1016/j.concog.2008.12.008. Zeidan F, Johnson SK, Diamond BJ, David Z, Goolkasian P. Mindfulness meditation improves cognition: Evidence of brief mental training. Consciousness and Cognition 2010;19(2):597-605. doi: http://dx.doi.org/10.1016/j.concog.2010.03.014. Quach D, Jastrowski Mano KE, Alexander K. A Randomized Controlled Trial Examining the Effect of Mindfulness Meditation on Working Memory Capacity in Adolescents. Journal of Adolescent Health. doi: http://dx.doi.org/10.1016/j.jadohealth.2015.09.024. Chiesa A, Calati R, Serretti A. 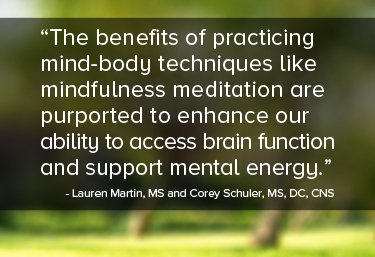 Does mindfulness training improve cognitive abilities? A systematic review of neuropsychological findings. Clinical Psychology Review 2011;31(3):449-64. doi: http://dx.doi.org/10.1016/j.cpr.2010.11.003. Saoji A, Mohanty S, Vinchurkar SA. Effect of a Single Session of a Yogic Meditation Technique on Cognitive Performance in Medical Students: A Randomized Crossover Trial. J Relig Health. 2016. doi: 10.1007/s10943-016-0195-x.